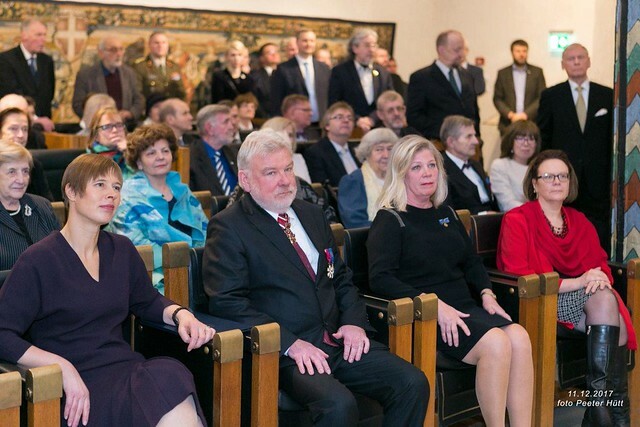 The Estonian Heritage Society, Europa Nostra’s country representation in Estonia, celebrated its 30th anniversary with a truly special ceremony held on the evening of 11 December at the Tallinn Town Hall. Over 150 participants gathered to pay tribute to the dedication of thousands of heritage professionals and volunteers, and listen to the congratulatory speeches delivered by the President of the Republic of Estonia Kersti Kaljulaid and other honourable guests. The President of Europa Nostra Maestro Plácido Domingo, in a special message read at the ceremony, also paid homage to the Estonian Heritage Society. Among the top-level representatives who addressed the audience were the Archbishop Emeritus Andres Põder, the Director General of the Estonian National Museum, the Undersecretary for Cultural Heritage of the Ministry of Culture, the Director General of the National Heritage Board, Ambassadors, and several representatives of heritage organisations that have been members of the Estonian Heritage Society since its start in 1987 and who were inspired to share their memories of that time. “The Estonian Heritage Society is a perfect example of what Europa Nostra really stands for. It was the very first NGO in the citizens’ movement for Estonian Independence. And now, 30 years later, as we stand on the verge of the European Year of Cultural Heritage 2018, this deep motivation behind our love and care for heritage is ever more important. We think that you, the Estonians, can show the rest of Europe the importance of cultural heritage for our shared future, for our democracy and for an inclusive, just and peaceful Europe,” stated the President of Europa Nostra Maestro Plácido Domingo in his message, which was read by Benito Casagrande and Markus Bernoulli, members of Europa Nostra’s country representation in Finland. The Estonian Heritage Society’s Chairman Peep Pillak and the Honorary Chairman Trivimi Velliste praised Maestro Plácido Domingo’s message in their speeches. “Europe knows about the Estonian Heritage Society. We belong and contribute to a powerful civil society movement for heritage. Our work has been appreciated by a world famous singer, Maestro Plácido Domingo, President of Europa Nostra, who congratulated the Estonian Heritage Society on our 30th anniversary”, noted the Honorary Chairman. On this celebratory occasion, the Estonian Heritage Society inaugurated an exhibition entitled “1988 – 2018: Life through symbols”, which displays heraldic symbols and coats-of-arms from individuals, institutions, local and military authorities. A large majority of these objects were made by the former Chairman of the Estonian Heritage Society Priit Herodes. In addition, a commemorative plaque was placed on the wall of the house where the organisation was established 30 years ago, and which is nowadays symbolically called “The House of Europe”. Europa Nostra wishes to warmly congratulate and thank the Estonian Heritage Society, one of the oldest civil society organisations in Estonia that has continuously defended cultural heritage in the past 30 years. Both organisations are currently undertaking initiatives to save the Patarei Sea Fort in Tallinn, which was listed among the 7 Most Endangered heritage sites in Europe in 2016, and recently presented the “Save Patarei” petition to the Estonian Parliament. The impressive restoration of the 13th-century Tallinn Town Hall was awarded a Medal of the EU Prize for Cultural Heritage / Europa Nostra Award in 2005.